I don't know exactly the origin of this dish, hopefully Italian, but I can assure you that this is one of the health-beneficial dish. 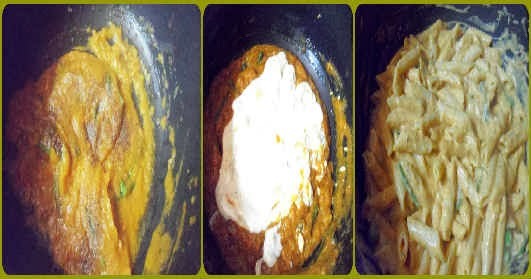 Pasta cooked in a sauce made with pumpkin puree, actual recipe calls for only pumpkin, but I added few carrot pieces in there for extra goodness. The creaminess comes from a white sauce made with little butter, flour and cheese. Pumpkins may look spooky in their Jack-o-lantern state, but they’re actually one of the most nutritious fruits out there. Loaded with antioxidants and disease-fighting vitamins. Pumpkins’ bright orange color may make them a good substitute for traffic cones, but the real power behind their hue is beta-carotene, a pro-vitamin that is converted to vitamin A in the body. Known for its immune-boosting powers, beta-carotene is essential for eye health and has also been linked to preventing coronary heart disease. Pumpkin is a good source of vitamins A, C, E and the B vitamins and dietary fiber. Mineral wise, it’s rich with potassium, iron, calcium, magnesium, phosphorus, copper, manganese, sodium and zinc. 1) Beta-carotene, lutein and zeaxanthin are some of the finest nourishment that help keep the optic system in good condition. 2) Pumpkin seeds have anti-inflammatory properties that are very useful against the arthritis and joint inflammation. 3) The anti-oxidants effectively protects the respiratory system from infections and free-radical attacks, reducing and healing asthma attacks. 4) Pumpkin is so healthful for bone development. 5) Pumpkin has high amounts of phytosterols that is similar to our human cholesterol. It can replace and normalize the cholesterol to a healthy level. 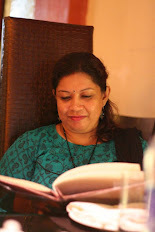 6) One of the cause of depression is the lack of trytophan in our diet. Pumpkin is rich with L-tryptophan, an essential amino acid that our body cannot manufacture. 7) It does wonders for boosting the immune system by increasing the production and performance of white blood cells; building resistance to various kinds of infections. 8) The high quantity of anti-oxidants in the form of vitamins A, C and E, and zinc, provide the synergistic healing virtues that are great for the skin. 9) The high content of zinc and carotenoids in pumpkin and its seeds help protect against prostate cancer. 10) Pumpkin seeds are equally good for our health. They are one of the best sources of plant-based omega-3s. So, add Pumpkin frequently in your diet for get all the goodness. This pasta recipe is a regular in my family. Kids just loves this. If your kids hate pumpkin, they won't know until you tell them. It's quite a camouflage recipe. End result, a super yummy and super nutritious pasta dish, which pumpkin haters will also love, that I can guarantee. Dried or fresh Italian herbs : 1 tsp. Cook pasta in big bowl of water with 1 tsp. salt and 1 tsp. oil until al dante. Drain and set aside. Boil pumpkin and carrots until just done, then puree in food processor. For the white sauce, take butter in a pan, add flour, saute for a minute before it changes its color, then add milk in there. Mix well. Add fresh cream and grated cheese in the sauce. Stir the sauce until cheese melts well. Remove from heat before it dries up. Now heat 1 tblsp. oil in another pan, add finely chopped garlic, chopped green onions, stir for 1/2 a minute, then add pureed pumpkin and carrot. Add green peas if you are using it. Season the puree with salt and black pepper. Now add cooked pasta and mix well with the sauce. Season the pasta with red chilli flakes and italian herbs. Note : you can any vegetable of your choice, like broccoli, spinach etc. Cook for few minutes, if you feel the pasta is looking dry, you can add little milk in the pasta and cook some more. 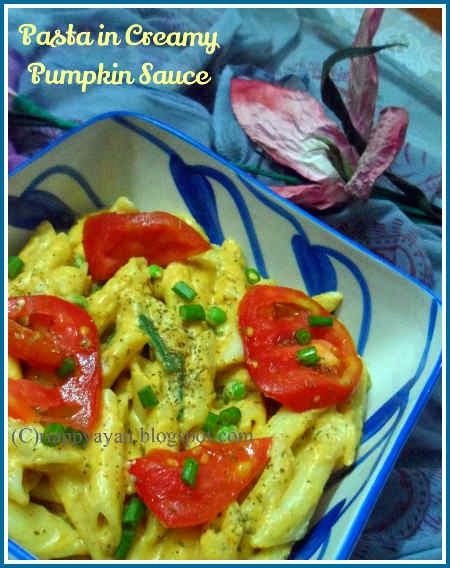 Sharing this yummy creamy pasta recipe to my ongoing event, "Spotlight : Continental"
Healthy healthy pasta recipe....................surely wud love to make it for my lil one!! 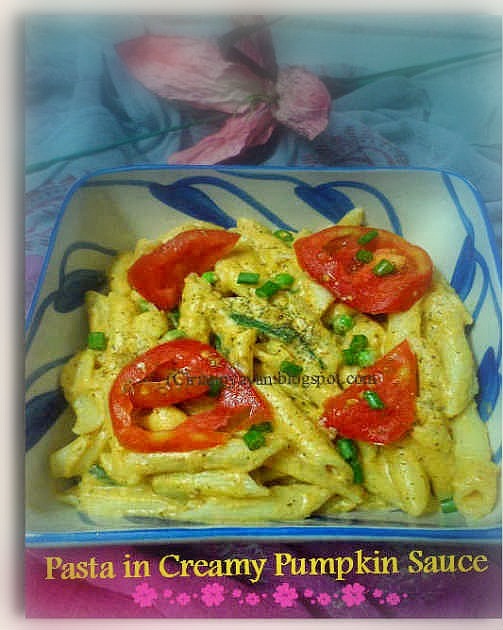 Your gave lot of info about pumpkin wow .I am a pasta lover so i am a fan of this dish.